SIP Industrial Products have recently upgraded our full Fireball heater range for increased energy efficiency, to take the lead in reducing our energy footprint through design and manufacture, and to comply with the updated EU Energy-Related Products Directive. The Energy-related Products (ErP) Directive is an umbrella term that consists of the Ecodesign Directive and the Energy Labelling Directive. Since 2009, the EU has been rolling out energy information on appliances like washing machines, electronics, and more. But in recent years, these directives have also been widened to include all domestic and commercial heating products. The Ecodesign portion of ErP dictates that all products affect the environment throughout their cycle, including selections of materials, manufacturing, energy usage, and disposal and recycling. The EU Commission estimates more than 80% of the environmental impact of a product is determined through the design stages. Ecodesign should be considered in all aspects of the products life, and thus the directive considers this essential to the effort to reduce a product’s environmental impact. Ecodesign considerations cannot compromise safety or functionality, or adversely affect consumer affordability. The Energy Labelling Directive outlines the requirements for transposing this information to customers. A simplified model has been established so that products receive an efficiency classification. The ErP Directive and its subsidiaries make up a collection of regulation that form a legal framework applicable for companies across the European Union’s member states that manufacture energy-using machines and appliances. The primary aim of the ErP Directive as a whole is to improve energy efficiency, reduce greenhouse gasses and harmful emission by 20%, and raising the share of EU energy consumption that is produced from renewable resources, in line with the EU’s 20-20 target. It is estimated that these directives will reduce annual CO2 emissions by 16 million tons in 2020. Whilst the ErP Directive helps to reduce environmental impact of design and manufacturing heaters and heating products, it also helps the consumer in a number of ways. Firstly, the aim of the ErP and it’s component sections is not only to drive innovation and improvements in the industry, but to phase out lower efficiency machines and appliances. This helps to improve the market and give any consumer a larger choice of energy-efficient products which will, in turn, save customers money in energy costs. How does this affect SIP Fireball heaters? 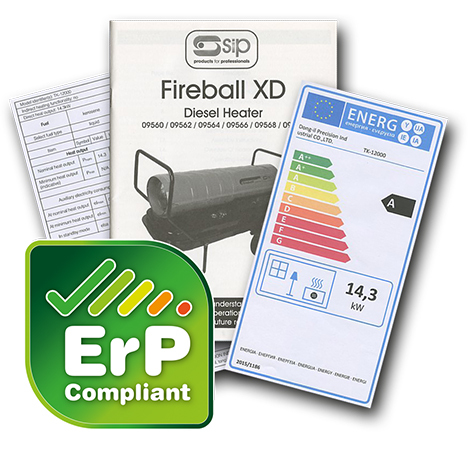 SIP Fireball heaters are now fully ErP-compliant across the range, whether electric, diesel, paraffin, or kerosene, and thus customers can expect to receive the same high-quality heaters that SIP have always offered, but with the added benefits that ErP allows! Our customers will have peace of mind that your Fireball heater has an energy classification as certified by the enclosed paperwork. Customers of SIP can be sure to receive the highest possible energy efficiency, and a responsible manufacturing practice, so that when you buy an SIP Fireball heater, you are actively helping us contribute positively to the EU Directives for reducing emissions and improving life for consumers! You’ll be getting more efficient heating products for your home, work, or business, whilst not paying any more for these benefits. As always, SIP will continue to innovate and play our part in ensuring we are practicing safe manufacturing procedures, and keeping our environmental footprint to a minimum, while improving the energy efficiency and reducing energy costs for our customers.